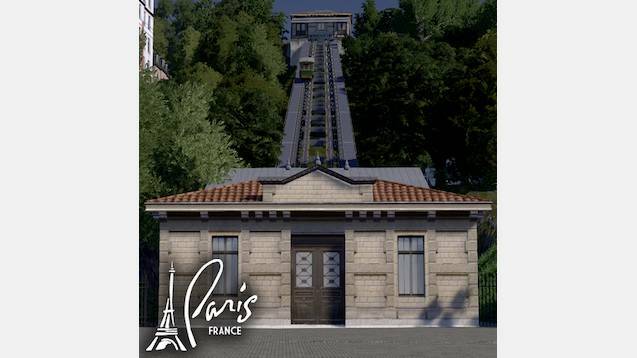 The construction of the Montmartre funicular was decided upon by the Paris municipal council in 1891. It was built to serve the Sacré-Cœur Basilica at the summit of the outlier of Montmartre and was inaugurated on 5 June 1891. In 1935, the system was converted to electricity. The funicular was completely rebuilt by the RATP in 1990–1991. Depending on the slope, station tracks might be misaligned from the building. In that case, use Move It’s nod editing function, while pressing on Alt key to edit station nodes. In case you use Mekarski inclined funiculars, use either one of them depending the way you set up train lines. Use Bi-Directional funicular tracks, in order to get 2 funicular, one per track. I will delete any message that indicates lack of reading of the asked material/guide.